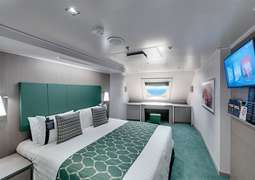 MSC Seaview is the second of the next generation 'Seaside' class of ship and is inspired by a pioneering beach condo concept. 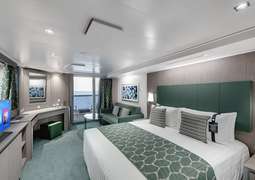 It will launch in June 2018 and cruise the balmy Western Mediterranean. 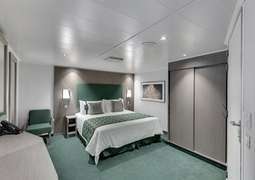 There is a range of modern, comfortable cabins onboard the MSC Seaview to suit your cruising style. The luxurious Yacht Club Suites feature a private whirlpool bath, and a balcony to enjoy the passing scenery. 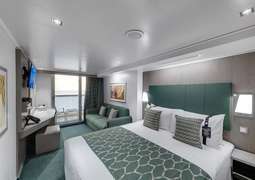 For families there are larger, more spacious Suites that can accommodate up to 10 people, equipped with all the amenities you need to make your cruise as enjoyable as possible. Onboard the MSC Seaview you'll find amazing dining to please even the pickiest eaters, with an extensive selection of restaurants to choose from. Taste the finest Mediterranean cuisine at the main restaurant, or a fusion of Hawaiian and Japanese specialties at the Pan Asian Market Kitchen. Enjoy an evening of drinks in a relaxing atmosphere at the Seaside Lounge, and maybe dance into the night at the Garage Club. There's never a dull moment onboard the MSC Seaview, where the opportunities to have fun are endless. Featuring the Forest Aquaventure Park and two bowling alleys, the whole family can experience an action packed day at sea, before settling in to watch an incredible Broadway-style show at the Odeon Theater. For a day of relaxation, the kids can be entertained in one of the many kids clubs, catered to both older teens and 1 to 3 year olds.